We would like to thank our friends at Rosco’s Spectrum Blog for running the original version of this article. Aged metal – it’s a technique we scenic artists create all the time, and each of us probably has 4-6 recipes in our paint-stained pockets that we’re ready to pull out at any time. In the case of a good old fashioned rust, one generally starts with slathering on a good burnt sienna, add in a titch of orange and /or raw sienna – sponge on, add some water for drips and then add in some darks at the end– viola! Instant tetanus! 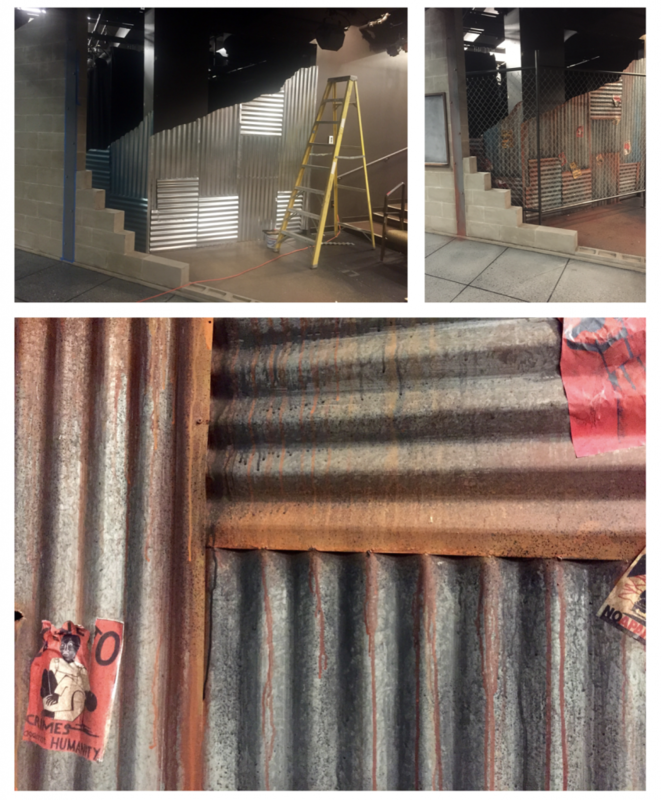 But sometimes, the set design lets us make that oxidized metal pretty. Sometimes, we get to create a bronze or copper patina. That’s when you’ll see Scenics doing the dance of joy because it means we get to work in the exciting world of color! It’s still going to look aged, old and nasty – but it will be a “pretty” aged, old and nasty! 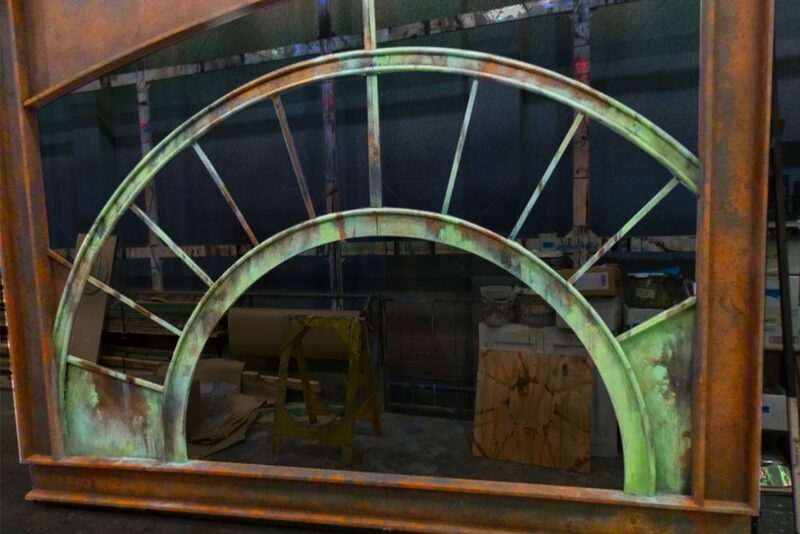 A patinated copper window set piece for “Oliver!” at Theatre Latte Da. Designed by Rick Poleneck, painted by Mary Novodvorsky. Panel painted by Johanna Miller. As with any scenic technique, choosing the colors to use is often the hardest part. In this case, it’s actually a lot easier than you think. 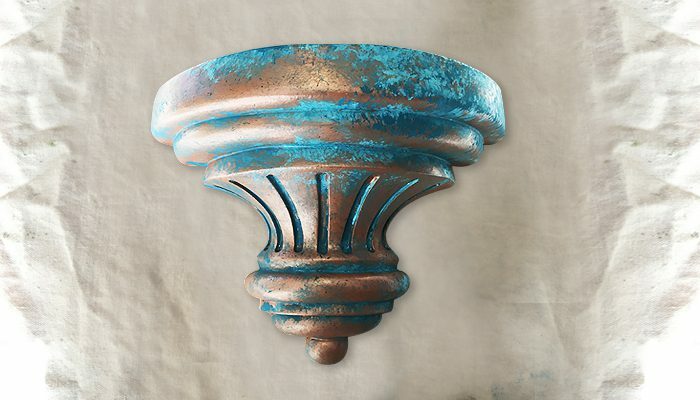 Ask yourself one question, what color do you need your verdigris to be – green or blue? 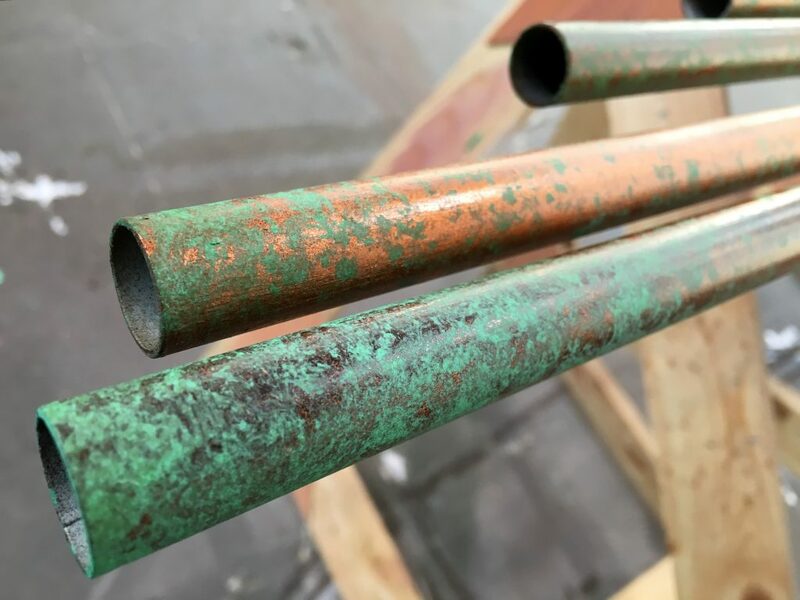 In this case, Scenic Artist Rachael Claxton needed to create a green patina to age the copper pipes on set. She ended up painting plastic pipes with copper,and then sponged on layers of Off Broadway Emerald Green mixed with white, and finished the effect with a light spray of “Glossy Wood Tone” by Design Master to add more aging to the coloration. When you need to go bluer with your verdigris, my choice is always a good Turquoise. I often use Iddings Turquoise Blue when I have large areas to cover, but can easily switch to the Super Sat version of the color as well, if that is what I have on-hand. Don’t have either? 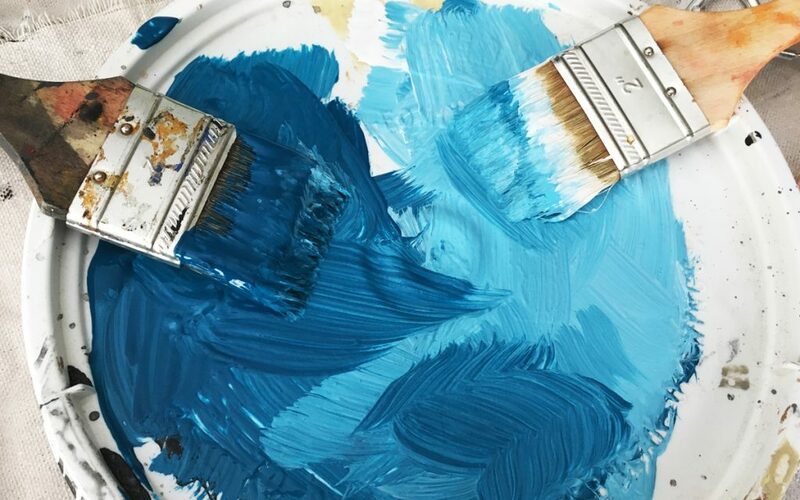 Try mixing your own turquoise hue using equal parts Off Broadway Phthalo Blue, Emerald Green and white – then adjust the tint to taste. I start with a mix of the turquoise paint with a white; to create a nice range of turquoise shades. 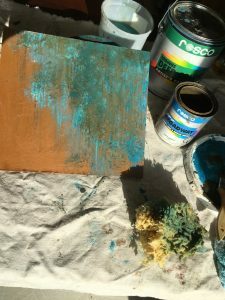 I have a secret to share with you- I am not a fan of stippling and sponging ON my rust and patina colors- I feel that I can often get a better, more organic effect when I scumble my colors and then use a barely damp sponge to sponge OFF my paint. 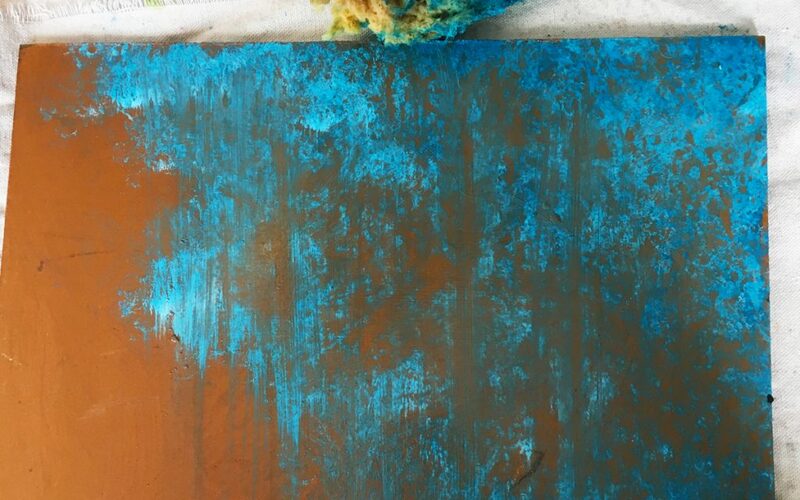 Begin by stippling a blend of lighter & darker shades of turquoise on top of a copper or bronze base color. 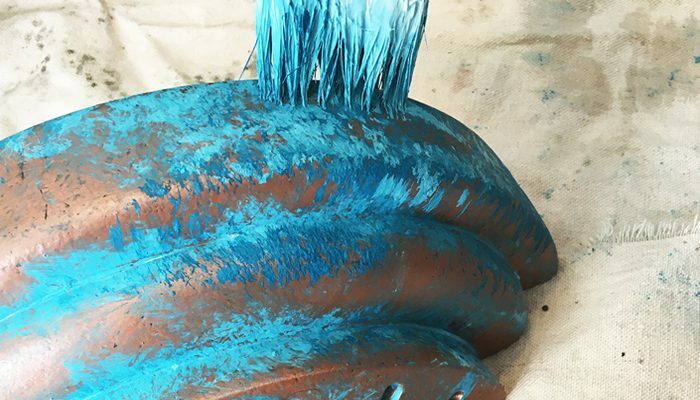 Then, while the turquoise paint is still wet, use a slightly damp sponge to remove the areas of color where you want your base metallic color to show through. Continue to add/remove paint where it’s needed and finish the effect with a quick dry brush action with the sponge to create a drip effect. 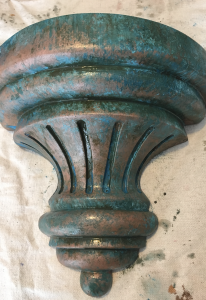 What you’ll have in the end is a great balance of patina colors mixed with areas where the base copper or bronze pokes back through. It is important to note that when working with Iddings on hard scenery, you often need to add a sealer into the paint, and/or a coat of sealer on top due to the binder being water soluble. The best patina effects happen when you have three-dimensional scenery to work with. Statues, fountains, or small accent elements are all great to work with. It actually gets easier! Start with a scumble of the patina color-blends, making sure to get the paint into all of the nooks, crannies, and corners. Then, carefully use a rag to gently rub all the paint from the “high” areas – letting the paint stay in the “valleys.” This is often called an “antiquing”. If you rub off too much, it’s always easy to lightly stipple more paint back on. 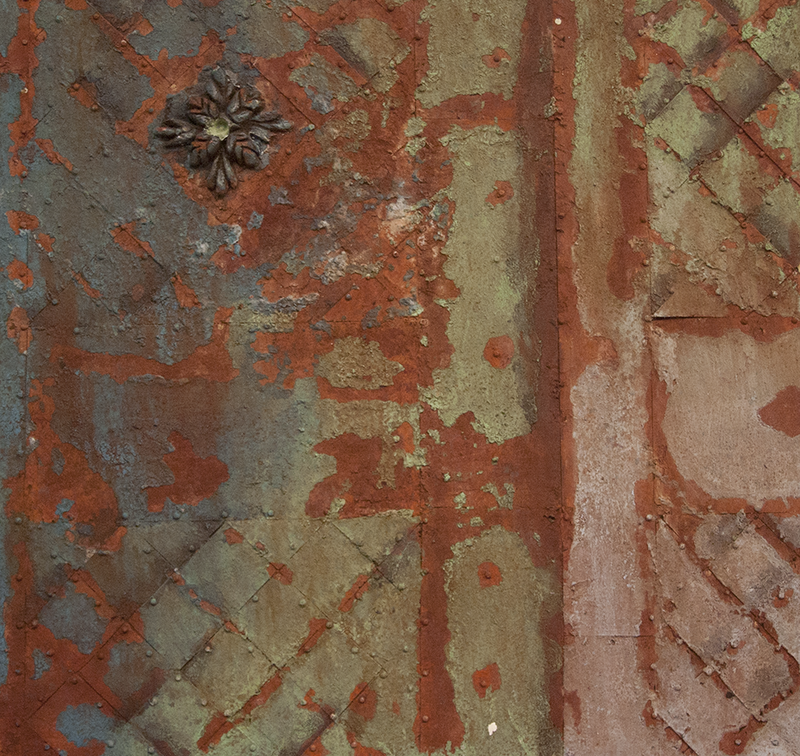 If your patina results are looking too bright and happy, you can add a layer of every Scenic’s best friend, raw umber. 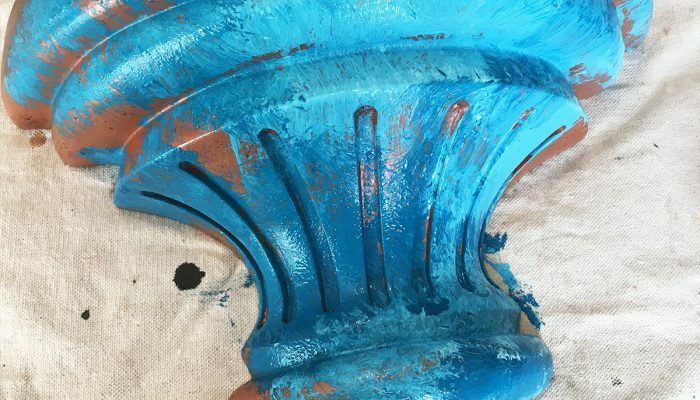 Mix it 50/50 with water and glaze it over your turquoise verdigris, and once again use a sponge to remove most of the paint. Not only will this tone down the brightness of the color and add an extra layer of dirt and age to the effect, but it will also shift the some of hue towards a slightly green shade for that much more variety in the tone. That, my friends, is faux patina in a nutshell. Choose Emerald Green or Turquoise Blue as your verdigris color and tint with white to create a variety of shades. Apply those patina-shades to your copper or bronze base-colored scenery and texture/tint to taste. 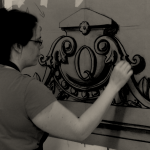 Angelique Powers has been painting for over 15 years, and has an MFA in Scenic Art from Cal Arts. Along with being the Charge Artist at Penumbra theatre she also freelances, and works with the University of Minnesota as an Adjunct Lecturer. She is currently most proud of her work as a Founding Board Member of The Guild of Scenic Artists and her work here on The Scenic Route. Hi. 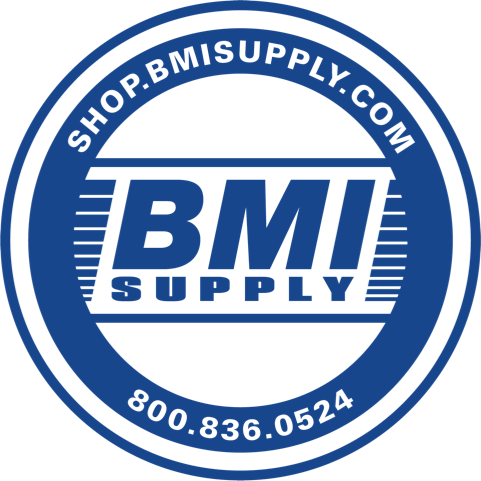 We bought some copper shim stock from http://www.shimstock.co.za a couple weeks ago. We are battling to get a uniform finish for inlays on a cupboard door. We are trying to get a “heat treated” patina finish. Any suggestions on colour for that?